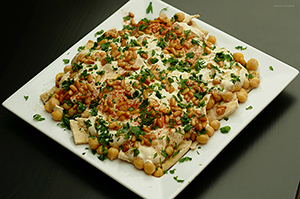 Chickpea Fatteh is a popular Middle Eastern breakfast dish made with simple ingredients and packed with flavours. The word“Fatteh” is dialect Arabic word, that comes from the verb “fa-tta” which means to crumble bread into small pieces. 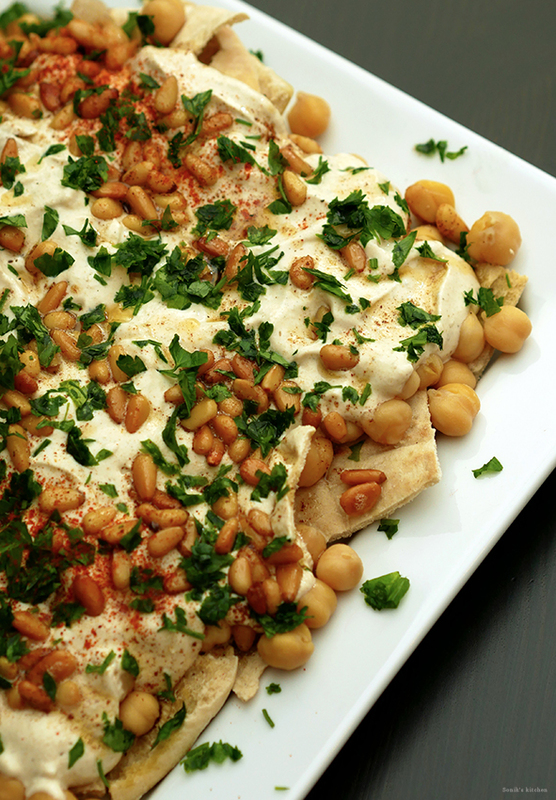 So that is why the dish is made of crumbled pieces of toasted or fried pita bread , layered with yogurt, spices, chickpeas and toasted pine nuts! Step 1 Pressure cook the chickpeas with 1/2 cup of water for 3 whistles. If there is remaining water, drain and keep the chickpeas aside. You can also cook the chickpeas in pan, pour enough water to cover the chickpeas, cook over medium heat until its done. Step 2 Preheat the oven to 180 C.
Step 3 Cut the pita bread into bite size pieces. Place them on a baking sheet and bake for 10 minutes, until golden and crisp. Remove from the oven and set it aside to cool. Step 4 In a bowl, stir together yogurt, garlic, salt, pepper, cumin powder, lemon juice and tahini paste until its well combined. If you find the mixture to be too thick, add a bit of water until you get the desired consistency. Step 5 Toast pine nuts with olive oil on a medium heat until they become golden. Step 6 Place the toasted pita bread on a serving dish. Top it up with the cooked chickpeas and pour the yogurt mixture over this. Step 7 Garnish with toasted pine nuts and parsley. Pour over the melted butter and sprinkle some paprika. This dish can be served as breakfast, brunch or an entrée at a party and can also be kept in the fridge overnight to have the leftovers the next day.